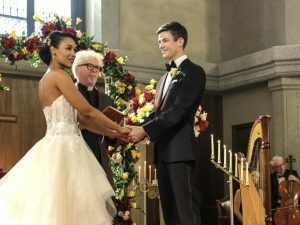 Kara and Alex travel to Earth-1 to attend the much-anticipated wedding of Barry Allen and Iris West, where they cannot get too far from their own relationship issues. But when an unknown group of criminals attack the festivities, they must join forces with Earth's mightiest heroes. Last edited by GateWorld; November 28th, 2017 at 10:36 AM. The beginning was awesome, showing us Earth X first. It looked so cool, but so bad. I skipped over some of the pre-wedding and wedding stuff and before anyone gets their knickers in a twist I do that with most shows if there are weddings. Weddings bore me to tears. But I don't really feel it with Barry/Iris, sorry. I feel like Iris is the James Olsen of Flash. They don't really know what to do with her outside of the love interest. It was an exciting crossover so far though. But how did Oliver manage to get Kryptonite? How did he even know about it? Last edited by Skydiver; December 3rd, 2017 at 07:23 AM. The show lost my interest about 3/4 of the way through "Supergirl", I didn't even bother watching part II (Arrow?) I'm DVR'ing all 4 parts, I might get bored and watch it around Christmas (I'm off work for 2 weeks) but, then again, the DVR is getting full..
Like Linda, I'm not a fan of weddings. And this show has far too much emo content to begin with? A 4 part emo-fast? Hmmmm.. It had a slow start, but most of the emotional stuff is at the very beginning and very end as a frame for the story. If you still feel the same after finishing the Supergirl episode, I'll be surprised. I enjoyed the episode. Alternate Earths like these creep me out...but I still liked the episode! I've liked alternative timeline stories ever since Trek TOS's "City on the Edge of Forever". did any one recognize the preacher that got vaporized, it was William katt also known as the ralph hinkley the greatest American hero. I "liked" how they didn't even pretend there was a reason Thawne was back. How would Goa'uld deal with Earth's financial crisis? does earth/human/ tauri deserve to be part of the allience of the ancient races?